From now through October, teams of scientists will be scouring through leaf litters, in shallow pools, under rocks, and in tree trunks for the world’s ‘lost frogs’. Searching in 14 countries on five continents, the researchers are looking for some 100 species of frogs that have not been seen in decades and in some cases up to a century. While some of the species may well be extinct, researchers are holding out hope that they can find the ones that are still hanging on, albeit by a thread. “This is something that has never been done before, and is hugely significant, not only because of the threats that amphibians face and our need to understand what has been happening to them better, but also because it represents an incredible opportunity for the world’s amphibian scientists to rediscover long-lost species,” said Dr. Claude Gascon in a press release. 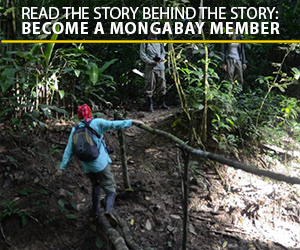 Gascon is co-chair of the International Union for the Conservation of Nature (IUCN) Amphibian Specialist Group, as well as Vice President of Conservation International (CI). 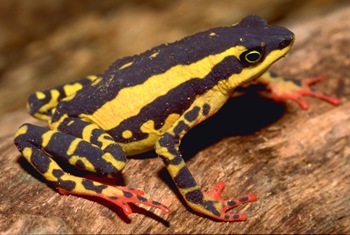 The three-colored harlequin frog Atelopus tricolor is one of the search’s target species. Native to Peru, it has not been recorded since 2003. Photo by: Jörn Köhler. As a join effort by the IUCN and CI, the search hopes to uncover a better understanding of the global amphibian crisis. Currently the IUCN estimates that 30 percent of the world’s amphibians are threatened with extinction. Amphibians have been battered worldwide by habitat loss, pollution, agricultural chemicals, overexploitation, and climate change. Yet the biggest impact on amphibians appears to be a fungal disease called chytridiomycosis. This amphibian-plague has wiped out whole species even in otherwise pristine areas. Experts say that in the past 3 decades it is likely that at least 120 amphibians have gone extinct. In a few cases captive populations in zoos have become a species’ last stand. “The search for these lost animals may well yield vital information in our attempts to stop the amphibian extinction crisis, and information that helps humanity to better understand the impact that we are having on the planet,” says Gascon. Amphibians, as a group, are often considered indicators of the health of an ecosystem. Given that their populations are susceptible to even small changes in the environment, researchers are able to notice impacts that may otherwise be overlooked. Also from Peru, researchers fear the Telmatobius necopinus may have been hit by chytridiomycosis. Photo by: W.E. Duellman. While human impacts have devastated amphibian populations worldwide, these tiny animals provide a number of ‘free’ services to humans including insect-control and helping to maintain freshwater ecosystems. Research on amphibians has also led to new pharmaceuticals for humans. (07/19/2010) With advanced genetic techniques, researchers have drawn a picture of just how devastating the currently extinction crisis for the world’s amphibians has become in a new study published in the Proceedings of the Nation Academy of Sciences (PNAS). Studying frog populations using DNA barcoding in Panama’s Omar Torrijos National Park located in El Copé researchers found that 25 known species and 5 unknown species have vanished since 1998. None have returned. (03/08/2010) Facing habitat loss, pollution, climate change, and the devastating chytrid fungus, there has been little positive news about amphibians recently. However, a story out of Australia brings a much needed respite from bad news. In 2008 Luke Pearce, a fisheries conservation officer, stumbled on a frog that had been thought to be extinct for over thirty years. 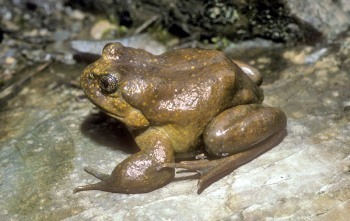 Not recorded since the 1970s, Pearce rediscovered the yellow-spotted bell frog (Litoria castanea) on rural Australian farmland in the Southern Tableland of New South Wales.